Major transitions in the 1860s through the 1880s brought an end to “the old way of life.” This time period of transformation was earmarked with an upheaval of peoples, lifestyles, economies and environment. The “old way of life” era was characterized by Native Americans, buffalo (bison) and unbroken prairie stretching from horizon to horizon. 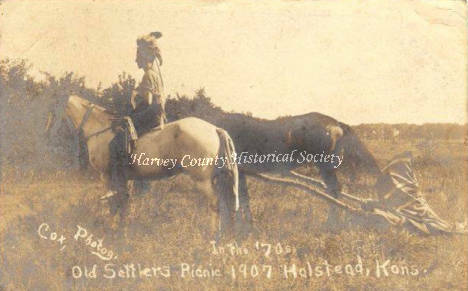 Located just across the Little Arkansas River from Alta Mill in northwest Harvey County was a Native American village. It was identified by the General Land Office surveyors, giving evidence “Kaw Indians” (actually Quivira/Wichita) were living there in 1860. The photo shown above is marked “In the ’70s” (i.e. the 1870s) which is indicative of the presence of Native Americans in the area of Harvey County. Photo from HCHM collection.